Mumbles Flooring is an established supplier of flooring with many years in the trade who wanted to raise even more awareness of their products and increase the footfall to their showroom. When Mumbles Flooring first approached us, they were concerned about their website looking dated and not being able to showcase the wide range of products and services offered. During our initial consultation, it became clear that the client had a precise vision of what they wanted the website to look like. Mumbles Flooring has a key target audience, customers looking for elegant and sophisticated flooring, and they wanted this to transpire in the overall design and feel of the website. The objective was to enhance the overall user journey and to showcase the vast array of flooring they offer. Ultimately, they wanted their website to be a digital showroom. 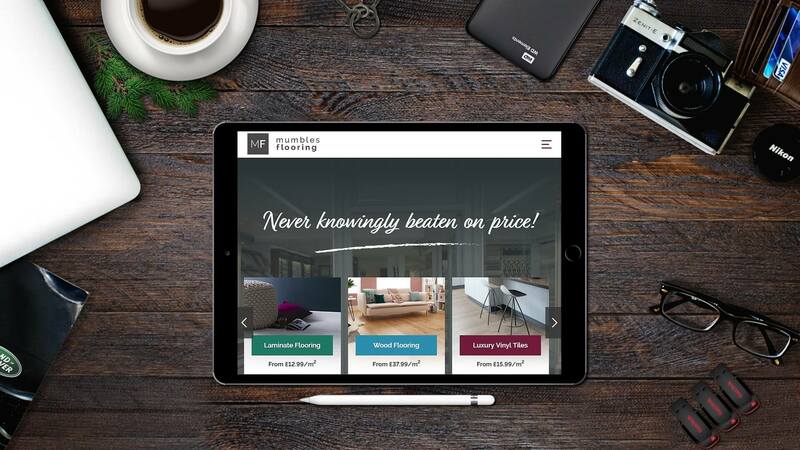 After the initial consultation with our design team and having discussed their goals, we were certain that a new website would be the perfect tool to promote Mumbles Flooring products and services, ultimately furthering their success. We created a new WordPress CMS, which allows the client to easily keep the site up to date. We defined clear and simple call to actions on the website, that were consistent throughout, to create a cohesive user journey throughout the website. The new website’s design is fresh, engaging and simple to use and gave Mumbles Flooring the new online presence they needed to stay ahead of their competitors. The objective was to enhance the overall user journey and to showcase the vast array of flooring they offer. Ultimately, they wanted their website to be a digital showroom. We defined clear and simple call to actions on the website, that was consistent throughout, to create a cohesive user journey throughout the website.